Mata Khivi was born in 1506 to Karan Devi and Bhai Devi Chand Khatri. Her father was a shopkeeper , and was a popular man in the neighbourhood. She inherited all his finest attributes of generosity and congenial spirit. She was married in 1519, when she was 13 years old. Khivi was married to Lahina for 20 years before he became the second Guru of the Sikhs. There is historical evidence that she had 4 children. Dasu, the eldest was born in 1524. Bibi Amro was born in 1532, followed by Bibi Anokhi in 1535 and son Datu in 1537. The family was content and doing well. As the wife of one of the town's richest men, Khivi must have enjoyed a great deal of respect. Her life was one of luxury and pleasure. Life would have gone on this way, had it not been for her coming under the influence of Mai Bhirai, who told her about Guru Nanak Sahib Ji's teachings. At approximately the same time, Lahina also heard of the Guru through Bhai Jodha, one of Guru Nanak Sahib Ji's earliest disciples. Lahina was a seeker of truth, and his curiosity was aroused. In 1532, shortly after the birth of his first daughter Amro, Lahina set out for his annual pilgrimage. On the way, he broke his journey at Kartarpur to see the Guru. On lislening to Nanak speak, Lahina begged to be allowed to stay and become his disciple. He had found the truth he had been seeking, and would never again stray away from it. He served his master with the greatest devotion. He busied himself, sweeping the visitor's quarters, washing their clothes and helping with the most menial work in fields. 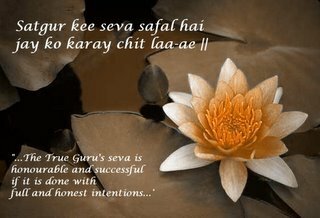 As his knowledee and understanding of the new teachings grew, so did the Guru's affection and approval of his disciple. This created a problem for the Guru's sons. Increasingly they grew jealous of Lahina, and took no pains to conceal their dislike. Without a doubt, this kind of stress and strain would have been very difficult for Lahina's wife to deal with. There are no records of her thoughts or feelings or how she handled the situation. Had she behaved in a bad manner during this time, you can be sure that someone would have recorded it. "...spoke of the equality of women and advocated a normal family life as the best way to attain salvation..."
After serving the Guru for some time, he was sent back to Khadur to see his family. His instructions were to take his time and to spend it spreading the word of the new faith to all he met. He did this well, and Guru Nanak was pleased with the reports he heard of him. The reports were so good that Guru Nanak came to his village twice to visit him and to reinforce his work with his own preaching. Khivi also learnt from her husband, and embraced the new faith whole heartedly. The women in the village taunted her, saying that her husband was becoming an important holy man, and would, therefore, soon forsake her. She knew she had nothing to worry about, and gave birth to two more children in that period of time. When Guru Nanak Sahib Ji left this world, Guru Angad felt a great need to prepare himself lot the work ahead. Nihali, a devout woman disciple, made her house available to hi m, while he prayed and meditated for six months. He allowed her to supply him with milk, but otherwise asked to be left alone. When Lahina became Guru Angad Sahib Ji, second Guru of the Sikhs, life became very busy for Khivi. People were now coming to her house to see their Guru. She had always been accustomed to a busy social life, but this was different. There was a purpose to all this coming and going that had not been there before. Moreover, Sikh teaching was very clear that one must earn one's living through one's own labour. Khivi took these teachings very seriously. "...She took upon herself the onerous task of managing every detail of the langar..."
Only the best possible ingredients were used, and everyone was treated with utmost courtesy. Her hospitality has been emulated over the centuries and has become the first cultural identity of the Sikhs. She helped the Guru in establishing the infant Sikh community on a stronger footing. She has been described as good natured, efficient, beautiful and all round perfect. She has the distinction of being the only one of the Guru's wives to he mentioned by name in Guru Granth Sahib. "...She distributes the bounty of the Guru's Langar; the kheer - the rice pudding and ghee, is like sweet ambrosia..."
There she is described as a "good person", "an affectionate mother" and as "one who provides shelter and protection to others." 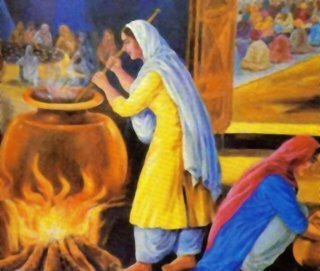 Mata Khivi ji did much more than work in the kitchen. She created a loving atmosphere for all whom she came in contact with. She and Guru Angad Sahib Ji were very fond of their children. They lavished their love and affection on not only their own, but on any child in the community. Their commitment was so strong that it gave a beautiful example to all who witnessed it. The Guru took great delight in spending time with the children, teaching them a modified version of the Punjabi script which was easier to learn by the illiterate masses. This new script, which was his invention, soon became known as Gurmukhi script. He is credited in popularising this alphabet, in which the Guru Granth Sahib is written. Each day there was special time set aside first to teach the children and delight in their clever ways. Then they would watch the children at play, and often watch wrestling matches together. From the games, the Guru would draw lessons for his congregation. Guru Angad, with the help of Bhai Bala and other disciples, wrote the first "Life" of Guru Nanak, and this work became the first published prose of the Punjabi language. "...she was able to persuade him that his responsibility was too much for him. The only way to cure the headache is to go back to the rightful Guru and beg his forgiveness..."
She took her son back to Guru Amar Das Ji, who on hearing that she was coming, came out to meet her half way. All was forgiven. Datu's headaches disappeared and Sikhism was spared another schism, thanks to Khivi's intervention. Khivi continued to manage Guru Amar Das's kitchen. She was proud of her children till the day she died. Her daughter Bibi Amro had married Bhai Jasoo of Basarke village. He was the son of Bhai Manak Chand and nephew of Guru Amar Das. Bibi Amro had become a preacher of Sikhism, and it is she who transformed the life of Guru Amar Das by introducing him to the teachings she had learnt from her father Guru Angad Dev Ji. Later, when Amar Das organised the teaching of Sikhism into specific districts and jurisdictions, he gave her a Manji, that is, he appointed her head to a diocese. Being appointed to head a Manji would be the equivalent of being a bishop in the Christian Church. She was responsible not only to teach the quality of the preaching, but also for collecting revenues and making decisions for the welfare of her diocese. Her diocese or Manji included Basarke, her husband's village. Today, close to the modern village of Basarke an old tank (man-made pond) bears the name of Bibi Amro Da Talab (Tank of Bibi Amro) in her memory. Mata Khivi ji had the distinction of meeting five Gurus. She lived to the age of 75 and died in the year 1582. Guru Arjun Sahib Ji attended her funeral. 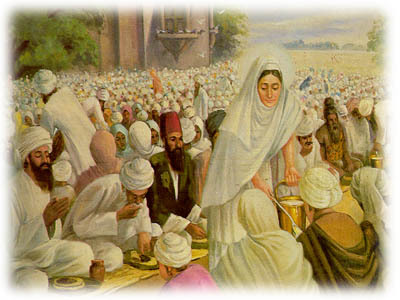 Her contributions to the Sikh cause can easily be divided into three parts. The first period was the twenty years of marriage before Guru Angad succeeded Guru Nanak. This period was a test not only for Angad, but for her as well. Any decisions he made affected her very much. Her response would also have affected his actions. "...She never complained, nor did anything to deter him from his objectives..."
The second period of her life as wife of the Guru was extraordinary in its devotion and dedication to the cause. The third and last period would be after her husband died. She continued to nourish the Sikh community and to work tirelessly for that which she now believed in with all her heart. 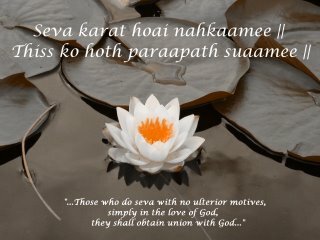 Here is an article of Mata Khivi Ji in Punjabi that I found in "Dashmesh Partika" Volume 4, 1999, from Gurdwara Sahib Dashmesh Darbar, Surrey B.C., Canada. Absolutely LOVE this blog. Thank you and please keep up this seva. Excellent stuff :) cant wait for more. Wiked resources keep it up.